Two teams of 8 players plus GK. Teams must always have at least two players in their opponents half of the field (award a penalty corner if teams break this rule). No hit outs; any ball over the baseline restarts with a long corner (unless of course it was deliberately player over the line by a defending player). Attacking side - Injector as usual, plus 5 players starting o/s the 23m area. Defending side - GK plus 3 players starting inside the goal. The ball is injected and MUST travel o/s the 23m area. Players can enter the 23m area as soon as the ball is played by the injector. 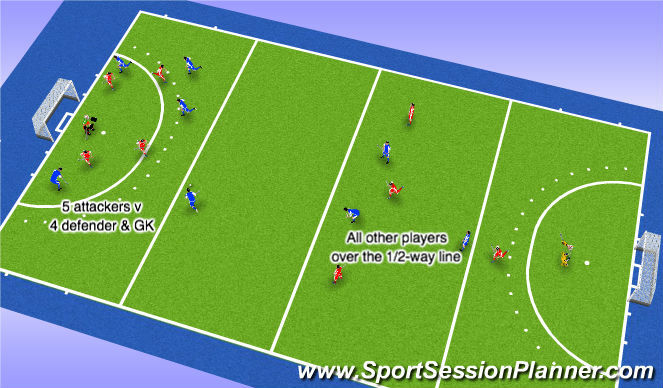 All non involved players must start over the far 23m line. All players are "live" as soon as the ball is played. 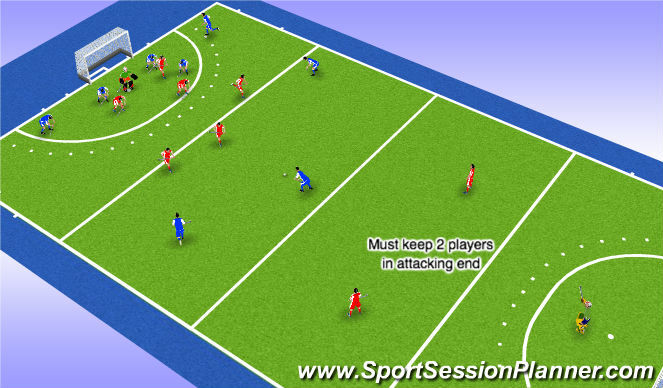 All non involved players must start over the half-way line. Any transgressions re numbers result in the award of a penalty corner.